One of the sadder “they’ve-cancelled-a-darned-good-TV-show-with-potential” cases is the 2003 Firefly Fox TV show that was cancelled after only one season. Created by Joss Whedon (the guy responsible for the hugely popular Buffy and Angel TV shows) Firefly followed the adventures of a spaceship crew captained by a Han Solo on overdrive rogue. Forget about “Greedo shooting first”, Capt. Malcolm Reynolds (played by the laconic Nathan Fillion) is the type of antihero sci-fi nowadays seems sadly short of. It was only when word-of-mouth caused the complete series DVD to be whisked off shelves that the money bosses realized the mistake they had made and green lit a big screen movie featuring the original cast. 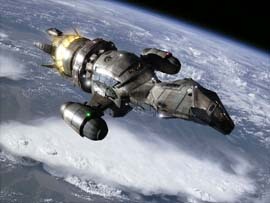 Like the recent Farscape: The Peacekeeper movie, the full-length Serenity (named after the spaceship in the show) will probably attempt to tie up loose plot and character ends from the TV show. While a full-length movie is to be welcomed and one can only hope that if The Matrix can spawn so many sequels no-one really wanted, that this one will see the start of movie franchise, the truth is that what we want is a new season of brand-new episodes, darn it! The film centres on Captain Malcolm Reynolds, a hardened veteran (on the losing side) of a galactic civil war, who now ekes out a living pulling off small crimes and transport-for-hire aboard his ship, "Serenity." He leads a small, eclectic crew who are the closest thing he has left to family -- squabbling, insubordinate and undyingly loyal. When Mal takes on two new passengers -- a young doctor and his unstable, telepathic sister -- he gets much more than he bargained for. The pair are fugitives from the coalition dominating the universe, who will stop at nothing to reclaim the girl. The crew that was once used to skimming the outskirts of the galaxy unnoticed find themselves caught between the unstoppable military force of the Universal Alliance and the horrific, cannibalistic fury of the Reavers, savages who roam the very edge of space. 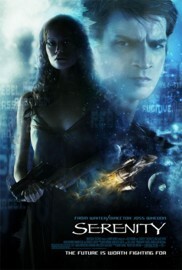 Hunted by vastly different enemies, they begin to discover that the greatest danger to them may be on board "Serenity" herself. Discuss with other fans on the Sci-Movie Page Discussion Board.